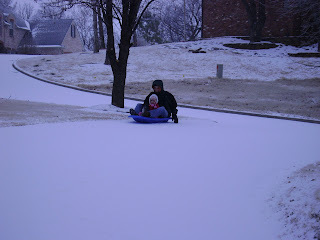 A few months ago, Craig and I bought a sled at Toys R Us on the off chance that we would get some good snow this winter! Well, the kids in the area have been out of school for the past 3 days because we got lots of sleet and a little snow. 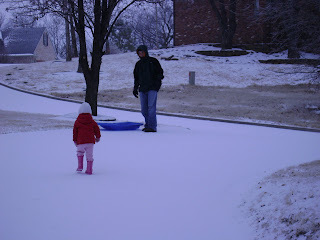 Daddy and Avery took advantage and took the sled out. Our yard and driveway are pretty hilly, and our neighborhood is VERY hilly, so they didn't have to go far. I wouldn't let Craig take a picture of it, but Avery came away with some battle scars. She took a face plant after trying out a round sled of a neighbor and the left side of her face is pretty scratched. I thought she might get a black eye, too, but she just has a bruise beneath her eye. I would put a picture of it on here, but a certain couple of Grandmas might freak out. 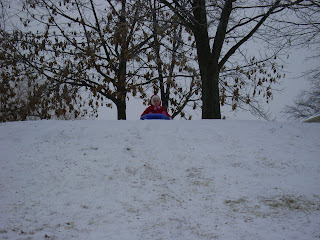 :) She is just fine, though, and went out to sled again the next morning! Ha ha. Avery's one tough cookie. Jacob wants her to come up here to go sledding with him!